Last night, The Time Nyack opened its doors to a who’s who of the music and arts scene, to celebrate the grand opening of The Time Nyack. Housed in a former factory, The Time Nyack is the first hotel of its kind in the Hudson Valley and will serve as an escape from reality for guests. The new luxury lifestyle hotel blends the unique history of the space and the personality and pulse of Nyack with the quality, attentive service and contemporary amenities that has come to be expected from both WYINC. developments and Time Hotels™. To create the ultimate hospitality experience, The Time Nyack houses a 150-seat BV’s Grill, an offshoot of the famed Bobby Van’s Steakhouses. The Time Nyack sits about a mile from the edge of the Hudson River at 400 High Avenue in Nyack, New York and was at one time a plastics and metal manufacturer. The Time Nyack’s industrial roots are apparent throughout - large loft windows, ceilings that reach 12-to-20 feet high, exposed ducts, bare brick walls, modern furniture, graphic and textured wallcoverings, integrated lighting, wood flooring and walnut paneling. The Time Nyack’s 133 rooms and suites are simple yet elegant, gritty yet graceful, and infused with loft-style aesthetic. “We took a forgotten factory warehouse and transformed it into a cutting-edge luxury destination for Nyack and all who pass through,” stated Michael Yanko, principal and co-founder of WYINC. 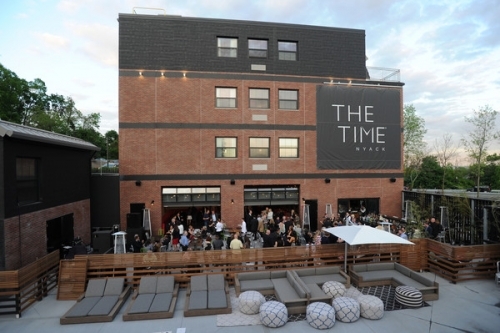 The Time Nyack was developed by WYINC., the boutique development house behind the Pod 39 hotel and The Whitman, in NYC, and is managed by Dream Hotel Group, the hotel brand and management company behind the the Dream Hotels, Time Hotels, The Chatwal and Unscripted Hotels brands. Glen Coben, founder and owner of the renowned architectural and interior design firm Glen & Co., collaborated with Architect of Record, Environetics, in designing both the public spaces and guestroom suites in a way that represents the eclectic spirit of Nyack, while reflecting the overall vision of WYINC. and the Dream Hotel Group. Nestled on a slope overlooking New York’s Hudson River, Nyack is home to many artists, bohemians and New York City transplants. The formerly empty warehouse that is now The Time Nyack is steeped in history; it was once home to spontaneous performances by local bands. A local radio station would often stream the live music from the warehouse on-air. Now, the gorgeous outdoor space with bar and pool deck will play host to Live Nation performances, a nod to the building’s past musical influence. Amenities include a vibrant lounge, rooftop bar, speakeasy, business center, outdoor seating with bar and pool deck, fitness center, bike program, free shuttle services, Tesla charging station, and more than 4,000 square feet of event space. For more information or to book your stay, visit http://www.thetimehotels.com/nyack/default-en.html. WYINC is a boutique development house headquartered in New York, developed & owned by Michael Yanko, Kerry Wellington and Don Wellington. WYINC developments are unique in both residential and hospitality, by combining cutting-edge design and development expertise where space is transformed in order to maximize ultimate potential. The WYINC principals have developed more than 1.5 million square feet of residential and hospitality properties across the spectrum of all asset classes since the company’s inception in 1992. Glen Coben, owner and principal of his namesake New York City-based Glen & Co. Architecture, founded the firm in 2000 in order to provide customized designs that realize a client’s vision while also engaging their customers. The firm’s projects demonstrate that brands can seamlessly integrate into the lives of others. Publications and outlets that have featured the firm and its projects include The Wall Street Journal, Metropolis, Hospitality Design, The New York Times, Interior Design, Hotel Business Design, and New York magazine’s Grub Street.